Are you looking for some interesting and fun rabbit facts for kids to help with a homework project of maybe you are just interested in them or even a teacher planning for a class? Rabbits are one of the best pets that you could have, full of life and fun and have enraptured people for centuries. They remain today one of the most popular pets in the world. We explore who they are, what they do, about their nature and character, where they live and what they eat, plus much more. 1. The average sleeping time for a pet rabbit is 8.4 hours. 2. Did you know that the world’s oldest rabbit lived for 18 years? 3. Did you know that a female rabbit can produce up to 30 young in a single season? They can even get pregnant again just after giving birth! 4. Rabbits have the ability to be litter trained. 5. The diet of a pet rabbit should consist of hay or timothy hay, rabbit pellets and fresh vegetables with a constant top up of fresh water. 6. As prey animals, Rabbits can get scared very easily as they are always looking out for predators. 7. When they are picked up, they need the support of one hand under their chest and one under their behind. 8. Rabbits need lots of grass and hay to help wear down their teeth which are constantly growing. 9. Rabbits have the ability to jump up to three meters long. 10. They also have the ability to jump one meter high. 11. Rabbits shouldn’t be kept alone and should preferably be kept in pairs. They get lonely and bored very easily and much prefer to be in the company of other rabbits. 12. Rabbits love to dig both in the wild and where they are kept as pets. 13. A ‘binky’ is a rabbits expression of joy . This is where they can run, jump up and twist their body and flick their feet up at the same time. 14. Rabbits love to groom each other. There is a term for this which is to ‘allogroom’ which means they will groom each other at the same time. 15. One of the ways that Rabbits can show affection is by running around a person. 16. A rabbit in the wild relies on a knowledge of their environment and surroundings so as to protect themselves from unwanted visitors. 17. As they love to eat, they need regular exercise to prevent them from becoming overweight. 18. A female rabbit is called a doe. 20. A young rabbit is called a kit or a kitten. 21. When they are born they have their eyes closed. Their eyes open after 2 weeks and will only leave the nest after they are opened. 22. The largest litter of rabbits ever reported produced 24 kits. 23. They have 28 teeth. These include four incisor teeth, two small peg-like teeth behind their top incisor teeth. They have six upper premolars, six upper molars, six lower molars and four lower premolars. These are their cheek teeth which they use to grind their food. 24. Rabbits that are born into captivity don’t tend to open their eyes until two weeks after they are born. 25. A baby rabbit is born without fur. The fur will start to grow after 3 days. 26. Did you know that rabbits live between 8-12 years if not longer? 27. Pet rabbits are related to the wild European rabbit who has the scientific name ‘Oryctolagus cuniculus’. This means ‘hare-like digger of underground passages’. 28. Rabbits are herbivores which means they love to feed on plants. 29. Rabbits are prey animals which means that they are always on the look out for predators who are out to get them. The most common every day predators are foxes, cats, and dogs. Howe ever, other predators are snakes, stoats, badgers, ferrets, snakes, owls, sparrow, hawks, falcons and kestrels. 30. They move around most during dawn and dusk and prefer to be underground during the daylight hours to avoid their predators. 31. Rabbits have eyes in the side of their heads which helps them have a wide field of vision. This helps them see around for them for unwanted visitors! 32. In fact, did you know that Rabbits can even see behind them? 33. They have large ears that move on their own, so they are really good at hearing things. 34. They have a really good sense of smell which lets them know when unwanted visitors are around. 35. They can stand up on their hind legs to help them scan the area for unwanted predators. 36. A rabbit’s hindlegs help them to move really fast and jump very high. 38. When Rabbits are being chased, they use awkward movements to help them lose predators and confuse them. 39. The way they communicate with their rabbit friends is through scent, such as squirting urine and leaving faeces. 40. They also use vocalisations and body postures to talk to each other. However, these are really quiet so as to stop predators from hearing them. 42. Did you know that a rabbit warren can have more than 50 rabbits living in it at any one time? 43. Rabbits are very social animals who enjoy living together and looking out for each other. 44. The common myth is that rabbits need lots of carrots and lettuce, in fact they actually need lots of hay every day. Too many carrots and lettuce is bad for them. 46. Did you know that their top front teeth grow really quickly at a rate of 3mm a week? 48. When they become aggressive, rabbits can bite, lunge, grunt or scratch. 49. 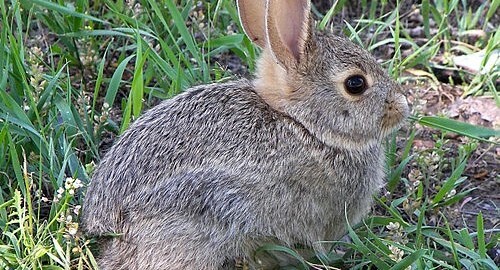 When in the wild, rabbits like to live in environments such as wetlands, deserts, grasslands, forests, woods and meadows. 50. Although they live in many countries throughout the world, more than half the world’s rabbit population resides in North America.